What a way to start your day! 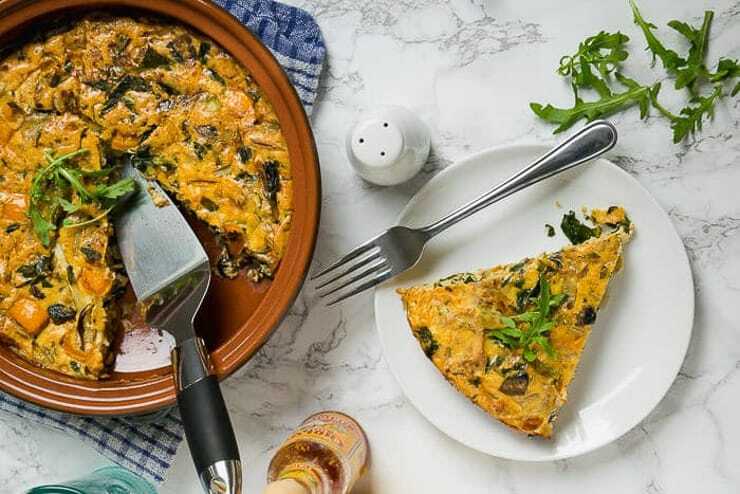 This Tuna & Mushroom Egg Bake recipe is sure to put a pep in your step! 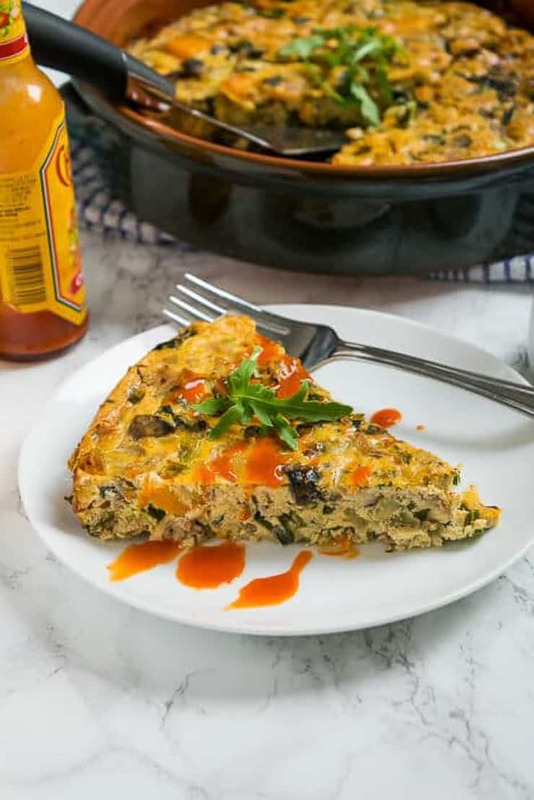 This Tuna Mushroom Egg Bake recipe is sure to put a pep in your step! You’ll love it because it is lusciously loaded with veggies, protein and healthy fats. You’ll love this recipe because it is lusciously loaded with veggies, protein and healthy fats. What’s also great is, you can take this and completely make it your own! Don’t have tuna? Try some mackerel or sardines. Don’t like mushrooms or peppers? Use whatever veggies you have to hand. You can’t sub the eggs though, I’m afraid – unless you don’t mind the bake falling apart on your plate lol! I made the exact same thing but subbed the tuna for some delicious shrimp and it was delightful! I’m still working on curbing my sweet tooth, so when I’m not having a sweet smoothie bowl or almond butter pancakes for breakfast, a savoury breakfast bake gets me back in balance. 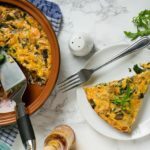 If you’ve ever wanted to just stumble out of bed with your breakfast waiting; make this ahead, freeze and defrost (only takes a few minutes), then start your day with a bang! For the egg mixture: Crack eggs in a mixing bowl, add coconut milk and seasonings. Using an oven/direct-heat safe pot, on a low-medium heat, sauté onion and mushrooms for 5-8 minutes till onions are translucent and mushrooms are soft. Add bell peppers, cook for further 3-4 minutes. Add spring greens and cook till they turn bright green and slightly wilted down. Add in your tuna, mix to incorporate. Add in your eggs. Place the dish in the oven for 40-45 minutes, until the egg is cooked through (check this with a fork in the middle). I like the top of the bake to be crispy so I leave it in until it is golden brown on the top. NOTES: If you don’t have an oven safe dish, you can simply use a pot to sauté your veggies and place them in a baking dish. For size, my pot is 25cm (10 inches). Hi I’m Whitney and I’m the bubbly food blogger behind WhittyPaleo.com. I’m a lover of plantains and I believe in eating rich, nutrient-dense foods to keep your mind and body at its best! I’ve followed the Paleo diet for nearly two years, so now I’m focusing my efforts on helping others develop a healthy relationship with food: forever! On WhittyPaleo.com, there are a number of recipes from gluten free, vegan, vegetarian and low carb, I *try* to provide people with luscious, easy recipes that they can make, even if they aren’t the most skilled home cook (like me!). Looks good! I almost never use tuna outside of sandwiches. This is great for Friday breakfast during Lent! The whole family loves it.